Everyday traffic delays produce frustrations and wasted time for road users who frequently deal with delays, especially during commutes and rush hour trips. Innovative solutions are needed for near-term implementation. These solutions produce significant operational benefits with only minor modifications to existing infrastructure, using less time and resources to make major impacts on traffic delays. The Saxton Transportation Operations Lab (STOL), located at the Federal Highway Administration Turner-Fairbank Research Center in McLean, VA, is focused on one of these alternative solutions: the lane-width reduction strategy. The lane-width reduction strategy reduces the current lane width on a congested highway segment. Narrowing lanes and shoulders adds an additional lane to the segment. For example, suppose a congested freeway has four 12-foot lanes in one direction, plus a 10-foot shoulder. The lane-width reduction strategy would transform this segment to five 10.5-foot lanes and a 5.5-foot shoulder (figure 1). The extra lane produces significant congestion relief without the need to widen the roadway. Lane-width reduction has provided congestion relief in states such as Florida, Texas, California, Washington, and Hawaii. When safety considerations are reviewed for the lane-width reduction strategy, narrower lane widths generally lead to reduced average travel speeds. Hypothetically, reduced travel speeds would reduce freeway capacities. However, with the addition of a new lane, the resulting capacity increase may be larger than the capacity reduction caused by reduced speeds. Some simulation studies have estimated that the widening of a road and addition of a new 12-foot lane could reduce freeway delays by 43 percent. Without widening the road, the addition of a new 10-foot lane would reduce freeway delays by 21 percent. These simulation experiments implemented narrow lane effects through an assumed speed reduction stated in the Highway Capacity Manual (HCM), where an 11-foot lane would reduce speeds by 2 miles per hour compared to a 12-foot lane, and a 10-foot lane would reduce speeds by 7 miles per hour compared to a 12-foot lane. Figure 2 compares one of this project’s newly developed macroscopic models with the existing HCM model. The new model appears to be more robust in its sensitivity to speed limits. Data were collected at real sites not available in the original HCM model. In parallel, the STOL research team developed a separate model (based on Highway Safety Manual procedures) to predict safety impacts of the lane narrowing treatment, and is attempting to develop new car-following models (for microsimulation tools) to predict operational impacts of the lane narrowing treatment. 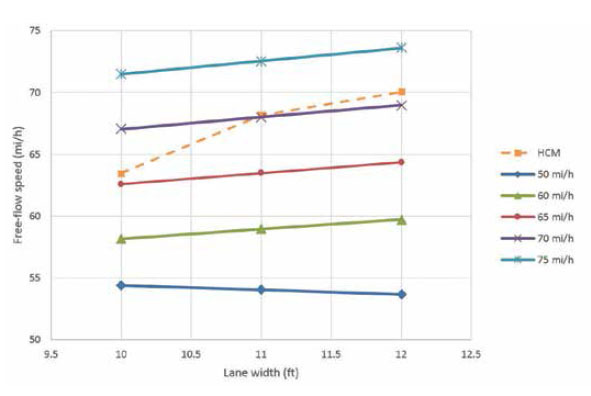 While measuring car speeds and leading distance, the team knew it would be important to ensure measurements were taken during “near capacity” or “at capacity” congestion levels — when driver behaviors are most likely to be impacted by lane widths. To ensure measurements were complimentary, the STOL team worked with Quality Counts, a transportation metrics company that uses drone technology for data collection. Video post-processing was completed by DataFromSky, which used machine-based graphics algorithms to convert visual images into numeric vehicle trajectory data. Drone data collection is taking place over real-world sites with narrow freeway lanes and nearby control sites with standard 12-foot lane widths, at three conditions: basic, merge, and diverge segments. The team will now attempt to identify trends in the headway distributions and speed distributions that reliably differentiate between narrow lane sites and control sites. The ultimate goal is to conduct real-world case studies of the new macroscopic, microscopic, and safety models, and use these outcomes to develop multi-objective (operational and safety) recommendations for agencies considering freeway lane narrowing treatment.